I had two meetings with my mentoring partners, faculty who are new to James Madison University and participate in our New Faculty Academy. I co-facilitated, with my colleague Bob Kolodinsky, a new workshop on how to get mentoring relationships off to a good start, on Wednesday and Thursday. I thought it went well: Bob and I (but mostly Bob!) managed to prepare a workshop that combined ideas from the mentoring literature (Bob works on getting certified as a coach) and tips and tricks for mentors with some applied activities. We advertised the workshop a bit late—only two weeks ago—but got good participation from mentors in our New Faculty Academy program, and from department chairs who want to improve their departmental mentoring. It looks like we may be able to repeat the workshop in individual departments! To go with the theme, this week’s “reading” (during my commute, read to me by Tom, one of the voices on my iPhone) was Lois Zachary’s The Mentor’s Guide. A good resource, particularly for hands-on activities for mentors. I used Zachary’s four-phase model of the mentoring process in the workshop; I think it is useful for mentors to realize that the mentoring relationship changes. Music: The New York Times has recently been highlighting the London Jazz scene (with an embarrassing tweet to boot, which turns out to be simply an unattributed quote—or paraphrase?—of Femi Koleoso, one of the featured musicians). In any case, the music is good stuff. Listen to the Ezra Collective (ft. Femi Kolas), Nubya Garcia, and other artists mentioned in the article. A now a three-month note??? Wow, this went by fast. One thing that I’ve definitely learned this year is that I won’t get any research, writing, or scholarship done in August and September, since this is the year’s crunch time for the career planning programs I oversee. Last week I was finally able to sort through the wreckage of partly-finished and barely-started projects and do some scholarship planning. On August 20, we had our one-day new faculty orientation; I am in charge of the substantive side of the program. This year, we invited not only all new (to JMU) faculty, but also faculty who were newly tenured and/or promoted. The idea behind this change was that faculty who achieve a career milestone may want to re-orient their careers and get to know their institution anew. I should note that our new faculty orientation—we changed its name to Faculty Welcome, considering the presence of non-new faculty—is not your usual Parade of HR PowerPoints (not that there’s anything wrong with that) but essentially a mini conference with poster sessions about campus resources, a plenary roundtable discussion about what’s happening at the university, and two sets of concurrent workshops on a range of topics related to teaching, scholarship, career planning, and institutional questions more generally (this year we had a total of 12 workshops!). The program included workshops that I thought should be of interest to more senior faculty, such as a roundtable of post-tenure faculty about what they wish they had known when getting tenure and my new “How To Say No” workshop. In September, we welcomed the fourth cohort of JMU’s New Faculty Academy. This is a yearlong career-planning and mentoring program for new faculty in tenure-track and renewable-term positions. Participants take monthly workshops (mostly facilitated by me) and meet with peer mentors how have extensive JMU experience. Luckily, this year we had “only” 39 academy participants (in the last two years, the numbers were closer to 50) for which I had to recruit peer mentors. Still, I spend the better part of a month recruiting mentors and matching them with mentees, based on forms about mentoring needs, experiences, and interests that we asked everybody to complete. David Harvey’s Brief History of Neoliberalism. Harvey is a leftie classic; I needed a more systematic introduction to the term “neoliberalism”, which gets thrown around a lot in higher education these days, and this book did it nicely. Occasionally, a phrase has Hitchhiker’s Guide qualities. Nice! Johnson/Smith’s Athena Rising. Burge and Johnson/Smith were recommended by a colleague. Both are useful as starting points for further readings on faculty careers and mentoring. I did not like the tone of Johnson/Smith’s book—the origin of the book is in mentoring in the military, the readers are assumed to be men, all involved are assumed to be heterosexual, etc.—but it is a useful collection of arguments and practical guidelines for men who mentor women, though the authors do not always succeed in their evident (is it really evident?) effort to prevent mentors from being patronizing. I wonder how the book reads in 10 or 20 years. Music: I am really getting into Schubert’s late E flat major mass, as a listener, not a chorister. Wonderful-weird music. 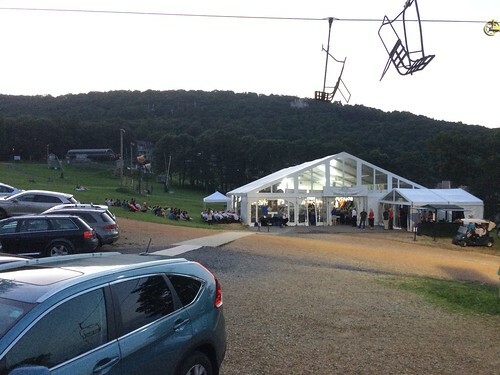 But the highlight of the summer was participating in an ad-hoc choir performing Beethoven’s 9th in the Blue Ridge Mountains in Wintergreen. Oh yeah!